The reason I started this bin was because my partner wanted to compost the leftovers from the kitchen. As I had been farming worms for about a year and had gained some good ideas from the internet, I decided I liked the idea of a continuous flow-through bin, as it would make harvesting very easy. The castings are used on the shrubs and flowers we have in our home. I do have other bins which I put only organically grown materials into, as the castings are used for our fruit and vegetables. The bin cost virtually nothing to make ( I had bought the bamboo the previous year for about 2 euro) as I used materials that were at our home. It took less than an hour to make. Yes it appears a slightly crude design, but I find it works very well. The old wheelie style bin belonged to the previous house owner and the piping that I used had been lying in a ditch at the end of the garden. I made the piping a bit more rigid by putting the bamboo that I had through the centre. 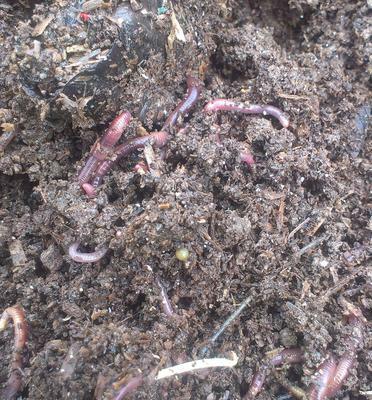 The worms were also sourced free from a manure pile at a local equestrian centre. At the moment the bin is in a small shed but I plan to keep it out doors once I have an intended area cleared for it. 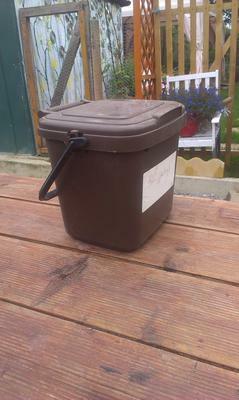 Our winters here do not get very cold so I feel the mass of the bin will be enough to keep the worms insulated. As it has wheels it makes it very easy for one person to move it about. 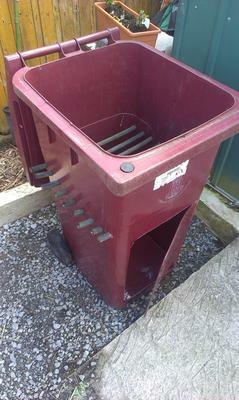 The bin has Red Wigglers or Eisenia Fetida worms. In the beginning there were only a few hundred but the population is increasing all the time. The bin is about 4 months old and there are well over a thousand worms now and there are cocoons and babies everywhere. At first I wasn't sure if the worm bin would be able to cope with the amount of food being added. 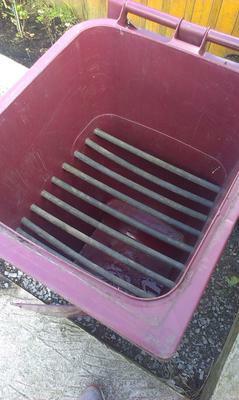 In the photos you can see the small bin we fill - we add a full one every week. I was pleasantly surprised to see the worms have no problems dealing with what I throw at them. What I feed them are the leftovers from the kitchen. I do freeze them in a large lunch box before adding to the bin to kill fruit flies. The main bedding is aged horse manure and occasionally I add some to the top to keep the fruit flies at bay. Harvesting the castings is a very easy process. Once in a while I check the underneath to see what the castings look like. If I feel they are ready, I take out an amount until I start to find worms. Someone did point out before that I should have made the piping at the bottom run from back to front, as they said the harvesting process would be easier. In my opinion I find it easier working from side to side. I only need to stretch to reach the back of the bin and when this is done, the rest of the harvesting is plain sailing. The castings are then added to plants that look like they are in need of some nurturing. I would not change the design of this bin. In fact I will be making a few more. The working height is perfect. There is plenty of room underneath to harvest the castings. Because I keep the moisture level of the bin in good check, there is not any leachate at the bottom. The portability is great and the worms appear to love it. I love it EggBear! I have always wanted to make one of these and WILL some day. Incredibly easy to set up and harvest LOT's of castings. I really like the idea of having a door at the bottom in order to control moisture levels. Leave door open to dry out or close to hold more moisture in. When making this type of continuous flow-through worm bin you can control the amount of castings and compost it holds by raising your poles or lowering them. I would also suggest for someone looking to build this type is to find one that has large wheels for easier mobility. Although not really necessary if you're not rolling it around on terrain. Okay thanks EggBear...Love, Love, Love it! Egg Bear, this is really nice. I love that it is easy to harvest castings. I'm having a hard time picturing what you do with the bamboo poles. I'd love to see a video of how you harvest the castings. Perhaps I can find one on YouTube. Oohhh, okay, the bamboo poles are inside the pipes. What did you place on top of the pipes initially, so your bedding didn't fall through? I saw a YouTube video showing someone putting down some paper bags. Was wondering how long it takes for them to break down, so you can harvest? I put some pages from a telephone book and then a thin layer of aged cow manure as it was more solid than the horse manure I had. This helped block the gaps between the pipes. Took about 3 months to break down... Got first lot of castings a few weeks ago so it will be a while yet before I get some more. Will take a video and post so will let you know. Thanks for sharing this great idea. It has got me thinking of a similar way to do this with what I have on hand. I'm guessing that it would not take much to make a flow through bin that uses something similar to the old stove grates. I work with PVC and have a lot of scrap pieces that can't be recycled so this would be a great way to use them. I also have a lot of 18 gallon tubs that I can put on a frame so the casting would drop through. Main problem that I can see is that if I use any worm other than European night crawlers or red worms. ENC's & red worms stay close to the top. any other worm would go into the castings. I would have to separate them from the castings after removing them. This may not be too bad though. Would give me the chance to remove some of the worms from the system so it don't get over crowded. Hi Dale. . Thanks for your comment. At the moment the bin is about 4 months old and I find it is still establishing itself. I am finding worms close to the bottom but this may change in time once what the worms find attractive down there is gone. This means for my first harvest it was only a small amount compared to what I get when I harvest my other bin. On the flipside the harvest is little and often where the other bin takes a bit of effort to harvest about every six months. Time will only tell but I imagine once the bin is established the worms will be more drawn to feeding at the top .. the bin is about 14 inches or more deep. I like this depth as I can bury food with ease and I hope the mass will provide insulation through the winter. Egg, this is fabulous! Thanks for sharing it. I can't wait for your "harvesting" you-tube video. I would greatly appreciate it if you could provide more construction details. I can't quite figure it out, but would love to try it myself. Thanks again! How do you scrape? Not sure I'm grasping procedure. Thank-you. Simply use a garden hand-rake or similar tool. The piping holds up the castings and by scraping at the underside of the material causes the castings to drop down. It's good to keep scraping until you find some unhatched cocoons coming out or keep scarping until you have as much castings as you need. when you see unprocessed material coming out then stop. Egg, I finally saw the video you posted. I really appreciate it, as I was missing the important details. Thanks so much! A pleasure mcarlson. Glad it is of help to people. These bins are still going strong. I harvest about 4 times a year and they keep well over the cooler winter months outside under cover. If I were to make improvements it would be to make the bedding area 6 to 12 inches deeper. My needs and capacity to compost are increasing so now I am looking into developing a windrow system. I will be using these bins to help breed a few colonies to help get the windrow started.